Rich, private moneylender Yoon Bok-Hee (Bae Jong-Ok) has three children. She then gets Alzheimer's and her three children go though difficulties to finally become grownups. Meanwhile, Jang Hoon-Nam (Jung Gyu-Woon) lost his parents when he was young. He lives with his deaf older brother. Jang Hoon-Nam has a strong sense of responsibility. He meets designer Ko Young-Chae (Jung Yoo-Mi), who is Yoon Bok-Hee's eldest daughter. 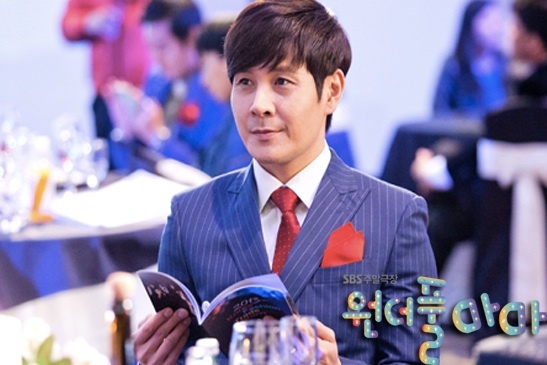 Jang Hoon-Nam and Ko Young-Chae work at the same company. Ko Young-Chae is arrogant and vain. At first, they have frequent conflicts with each other, but begin to fall in love. "Wonderful Mama" takes over the SBS Saturday & Sunday 20:40 time slot previously occupied by "My Love, Madame Butterfly" and followed by "Passionate Love" October, 2013.
lrt Dec 07 2018 7:59 am Spoiler....this writer had the lead become engaged to not one but two sisters even though he didn't know!! !...sick and Why did the DNA DR. not tell the chairman the truth with the first results? YooahVicky7 Jul 15 2018 5:00 am Still watching this in 2018 for the second time, love this drama with mah fave actors in it! Bdxpelik May 24 2018 12:44 am Whoa! Prince Lee Yeong and his cute younger sister from Moonlight Drawn by Clouds is in here?! Whoa! The drama sounds like something similar to What Happens to My Family, even the episodes are almost as many. Hmm, I'll consider it. Though I'm quite certain it's gonna annoy me to death because of those three siblings, just like WHTMF. But I expect some sweet, heartbreaking family moments. Cwohughes Jan 11 2017 6:18 pm Beautiful drama! It shows how even through adversity love can change and bring people together. Kelly Aug 22 2016 4:04 pm This is one of the best drama about the family topic. When i was watching it, i imagined that i found i'm not my mom's daughter or my mom have a disease and can't remember me. I cried, especially the last episodes. This film let me know about the love, the sacrifice that mom gave to me and it's very hard for me to live without mom. I also learnt that there are a lot of ways for mom to give their love. Sang Ho's mom really love him and want the best things for him, but she show her love in a different way. Sometimes you think that mom doesn't love you, but it isn't. She always love you, everytime, everywhere. It is possible that one day, your mom has Alzheimer or she has a traffic accident so you should look after your mom, show her your love, make her happy. You don't know exactly how long you can stay with your mom. In my opinion, i think 48 episodes is too long. If you don't want to watch all the drama but still understand it, you can watch just a few beginning episodes (1-5) and a few last episode (45-48). The average rating 7.3% is quite good, it is nearly equal Running man. There are a lot of dramas just have 3% or 5%. l really love the chemistry between the three kids! They are so united, fight, tease, blame each other. They look like real siblings. Sometimes the three musketeer are annoying to death, and rude to their mom, but they also growing up along the time. Their mom is like the captain and it's so cute! For the characters that l hate the most.....too many annoying and evil people in here l can't even rank them. Bernajae Sep 05 2015 7:36 am It's hoon Nam sii min soo...the lost child of Yoon bok hee..
Bernajae Sep 05 2015 7:30 am I really love this movie.I want to know the soundtrack of this movie..except shin jae song..(I love you want you love forever)I want to know the exact title of this song..
bella Aug 24 2014 7:54 pm Me and my husband have watched almost 20 korean dramas. I never made comments before but this one is an exception. For the family drama genre i must say wonderful mama is the best. Me and my husband have learnt alot of life moral education from this drama. How to educate and raise your kids. Best plot and ending. Loves the actress and actors. My favourite so far besides empress ki. David tran Mar 28 2014 12:55 am Any can tell me who is the lost bok-hee's son? Hoon nam? Or some one else? Asoka Feb 05 2014 8:57 am To "wonderful mama" I want to know the soundtrack where Young Chae and Hoon Nam in the park after Young found that they still rich. tq. Will there be a soundtrack to this movie? Alejandro Higashiyama Nov 15 2013 3:22 am Enjoyed the series very much. Wanted to see Chairwoman Choi Eun Ok to be punished more severely! I notice a number of Kdramas' endings the villains get away with a slap in the wrist. Davia Oct 29 2013 12:29 am I really like the acting and the characters in this drama. It is very enjoyable to watch and is a good balance between melodrama and romance. It's a serious drama but light hearted and fun at the same time. The only problem with this drama is the back story that Bok Hee's ex left her and married his ex fiance that stole his and Bok Hee's child and gave it away to some unknown person. No sane person would be able to stomach marrying someone like that let alone have children with her and then to keep apologizing to her for decades. And Bok Hee apologizing to her too was also unbelievable. What right did they think Eun Ok had to force him to marry someone he didn't love. She knew he didn't love her when they were engaged. But apart from the sickening back story the rest of this was very enjoyable and heartwarming. cheszka_47 Oct 03 2013 2:22 am this is the BEST KOREAN Drama i've ever watched..I LEARNED Many Lessons.. I Love it! This deserves an award!! karletta Sep 30 2013 12:15 am I love this drama but I thought it was going to be 50 episodes I can't believe it ended so quickly. I wanted to find out if the treatment worked, I wanted them find out that he is her son. I dont care if others didnt like. The topic of this show was one that hit home for me. My great grandmother died from this disease. So even if this is not a true story I still wanted to see her make..it would have been like seeing my greatgrandmother make it. Page Sep 27 2013 11:23 pm Finish Watching Episode 47 & 48. This was a beautiful Ending. All Truth reveal on Episode 47, great and surprising story line on episode 47..
tp Sep 27 2013 4:38 pm I've just finished the last two espisodes and was a bit disappointed, feeling like it was unfinished or incomplete! The characters like Han Dong-Soo all of a sudden disappeared unreasonably without any trace/mention. Then Lee Soo-Jin also was out in the last 6 or 7 episodes despite she was also the main character in the drama. Hmm! I think there should've been two more episodes in order to end the drama beautifully. Nevertheless, I still love to watch this drama over and over again for all the cast members are good looking & acting. Page Sep 23 2013 7:29 pm I have watch episode 47 and 48 (raw), i still don't know who her first son really is. Do anyone out there know who her first son is? What happen to her driver that drove her around. Did I miss something that I can't recall what happen to the driver? I just love this drama, but I lost track on some episode? OMG! Help? tp Sep 21 2013 6:29 pm Why does Han Dong-Soo disappear in the last few episodes? This drama is such a hit. I really love and enjoy watching it. Wish all the dramas were well written like Wonderful Mama. Congrats! mariana Aug 31 2013 1:07 am wow! yooyoung cute! RATINGS WILL DROP DOWN SIGNIFICANTLY GUARANTEED!!!!! Lizzy Aug 17 2013 8:44 pm I have to admit i had low hopes for this drama too,I wondered why are they all connected?, this doesn't make sense.But by watching the last episodes I understand now they don't want to rush thing there are about more than 10 , one hour episodes left.So I feel they will be able to close all the seemly missing holes and gaps in the story like they started to do in the last few episodes so to any one angry/mad don't judge an unfinished drama and if you don't enjoy don't watch. There are tons of popular dramas I hated but i never post my hate online.Also about the chemistry I could tell it was awkward that's what made me stray away from this drama in the start I wondered, she's his girlfriend why call him boss?, why is she so shy when it comes to the romantic parts? But after something major happens (Don't want to spoil it!) they seem like a normal couple so keep watching trust me it will get better! Ray Z Aug 04 2013 9:09 pm Anyone know the name of the actress that plays the secretary "Miss Kim"? Edward Jul 31 2013 10:00 am I stopped watching at beginning because no good for me. I try again and now better. Lee Jul 15 2013 9:50 am Okay, no rude comments and only respect. Unfortunately I agree with the others. I gave up watching. I'll just tune into the next drama. Please post here when this one is wrapped up. Nanmo Jul 08 2013 7:55 pm Ratings are so low. I agree please end it and replace it ASAP. It's the only korean drama I can't stand to watch. No chemistry.-Nanmo in USA. c0mm3nt4t0r Jun 26 2013 5:43 pm I like the story of this drama, and the fun characters: the 2 brothers and sisters. mitch808 Jun 21 2013 2:12 pm Not surprised at all for only 7 percent rating up to 17 episodes. NR episode 18, Viewers probably dropping out. I endured up to 14 episodes, jung yo mi was only actress that kept me going. I enjoyed watching her in Rooftop Prince. Why this was genre: comedy is beyond me! (only 1st ep) Totally agree with one comment, this should drop out early. Nothing but typical kdrama same-o same-o, Arrogance, grief, Corporate "King of the hills-screw you over" screenwriters must be running out of material. How this will survive 50 episodes with only 7 percent will be beyond a miracle! Dave Jun 18 2013 10:14 am Wow this drama is weak. Hopefully they cancel it early like they did tasty life. The drama before this with nam nabi was great. We need more good dramas. Greenluvs Apr 23 2013 2:11 pm I can't wait! I'm excited about the leads! Cedric Feb 08 2013 1:22 pm Damn the bad girl from Rooftop Prince will be the leading actress? alma Feb 02 2013 4:50 am im so excited for this new drama of jung gyu woon oppa!!!! saranghe!